Bungalow/Craftsman. 2-story, 2-bay, hip-roofed, Foursquare-style stuccoed frame house with wide eaves and small shed-roofed dormer on the front elevation. 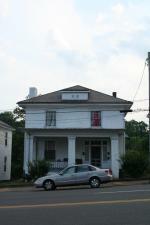 1-story porch has large stuccoed frame piers and balusters. Windows have Craftsman-style 8/1 sash. Door has sidelights and transoms. Metal louver on dormer. Side porch entrance added on west side. May have had a slate roof before asphalt shingle.